These hot temperatures call for some fun ways to beat the heat, and what better way to stay cool that with Water Balloon Games! 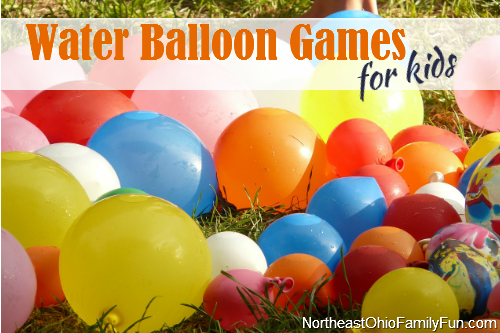 Try out these fun games and activities that you can play with a water balloons. Water Balloon Basketball – Grab an empty bucket, basket or box. Put it on the ground and step back a few feet and toss the balloon into the container. If you make the shot, step back another foot and try again. See who can make a basket from the furthest distance away. Water Balloon Obstacle Course – Create an obstacle course in your backyard. Use your imagination to create the obstacles (jumping over a pile of balloons, running in between two lines of balloons, etc) and see who can make it through without getting wet! Water Balloon Batting Practice – All the baseball fans will love this water balloon game. Have your child hit the balloons on their own, or join in the fun and pitch the balloons to them. Musical Water Balloon Hot Potato – Form a circle and grab one water balloon. When the music begins, start passing around the water balloon. When the music stops the person holding the balloon is out. Continue until only one person remains. Make it even more exciting by tossing the balloon instead of passing it. Water Balloon Piñata – Fill your balloons, tie them from a tree limb and let the kids start swinging. Use blindfolds to make it even more challenging. Water Balloon Yo-Yo – Love this idea for making a water balloon into a yo-yo. All you need is a small balloon and a rubber band. Water Balloon Relay Race – Relay races are a big hit in our household. The kids love making new courses, getting timed and trying to fun faster and faster. Add a fun element to the relay race by requiring the running to hold a water balloon and having them pass it to their team mates before the next person can start running. Bobbing for Water Balloons (with your hands!) – Fill up a small swimming pool or plastic container with water (add a small amount of dish soap to create suds) and add 5-6 balloons to the water. Take turns retrieving the balloon from the water. See who can get the slippery balloons out the fastest. Water Balloon Target Practice – Use hula-hoops, pool noodles or sidewalk chalk to make a target and then let your kids start tossing. Bring out a pad and paper or chalk board and have them keep score. One Person Water Balloon Toss – Have fun throwing the water balloon as high as you can in the air, and catch it without breaking it. Multi Person Water Balloon Toss – This is a fun game for two or more people. Stand a few feet apart and toss a water balloon back and forth. Keep stepping back and see how far apart you can get without breaking the balloon. Know of any other Fun Water Balloon Games? Leave a comment below and we'll add it to the list! How about this Angry Birds water balloon game – I draw the pigs on a wall. Love that idea! Thanks for sharing.